Are you dreaming of becoming a Cabin Crew to one of the largest airline companies? Good news ladies, Qatar Airways will be having a recruitment event this 30th of April 2017 in Cebu and join their award winning team! 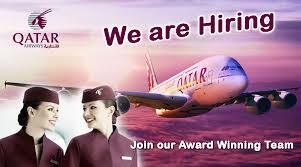 The Qatar Airways Cabin Crew team is growing. And they are looking for candidates who can deliver their mission by providing “Excellence in everything we do”. Known for their 5 star hospitality, they’re looking for future Cabin Crew who can be part of their “World Class Global Brand”. Join their multinational Cabin Crew Team and enjoy a tax-free remuneration package including accommodation, allowances and transportation for duty. *** Please note that this event is an Open day, where you are required to come and submit your application personally. I am looking forward to attending the 30 April recruitment event. I had finished my Cabin Crew Training at Omni Avaition. I am AITA certified. Hi. Is it okay to come tomorrow for the recruitment day even though I do not have a passport? I am still applying for my passport in DFA. All I have here is my resume and passport size photographs and also my full length photograph. Thank you!